cf/x alpha handles photos much like an illustration application. All edits are non-destructive, meaning that the fidelity of the original photo is maintained no matter how often it is mutated. You can crop, scale, rotate, and reposition the photo however you wish; you can also group together photos just as you would group objects in most applications. All of that is pretty standard fare, of course. It’s only when you customize photos (or grouped photos) that you’ll begin tapping into the app’s full capacity. cf/x alpha’s Composition Control window is subdivided into Properties, Blending, and f/x. Properties lets you set the exact size of your photos and add borders and drop shadows. Blending lets you choose how the photo will blend into its neighbors; among dozens of interesting options are standard fades, scan lines, and three-dimensional rotation. The main attraction of cf/x alpha is its automated collage generators. Canvas Fill, for example, can create a collection of photos in different sizes and crops that look great with a white border. Image Heap and Image Sweep are particularly elegant generators, positioning your photos like a pile of leaves or papers blown to the side. Arrange By Shape collects photos within a well-defined shape such as a star—though the more you adhere to the shape, the smaller the photos become. Finally, Mosaic is a generator that creates collages based on another photo. It’s fast and flexible, allowing you to create a collage of, say, puppy photos that actually looks like your puppy. 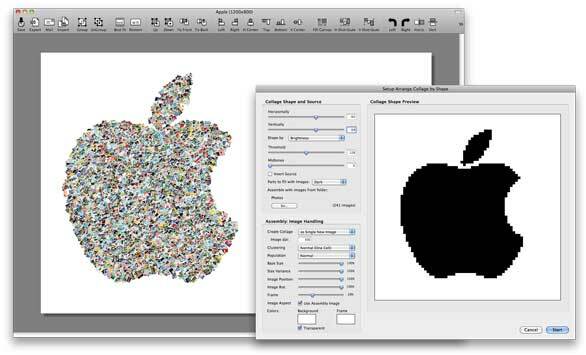 cf/x alpha allows you to create many types of collages, including a collage within a shape. Unfortunately, cf/x alpha has a number of shortcomings. It does not have a media browser to directly import pictures from Apple’s iPhoto ( ) or Aperture ( ) or Adobe’s Photoshop Lightroom ( ). The app also lacks multiple undos (a standard for pro-level editors) and a basic text tool (a rather odd omission given that you can apply text to any photo through f/x; there is, however, a text tool in the more expensive alpha pro). And it’s regrettable that cf/x alpha doesn’t share the same simple approach to collage-making as its sibling cf/x collage, which automatically fills empty spaces and resizes neighboring photos when the border between them is adjusted. The most confusing aspect of cf/x alpha is the developer's view that you design small and export large. The canvas size is tied to to the pixel-per-inch meaure (pixel density) of your display, a questionable effort to ensure that the size of the document on your monitor matches the size it will be when printed. There are two problems with this approach. The pixel-per-inch measure varies significantly among Macs, and it's an obscure spec you'll likely need to look up online. And while you're probably used to using the full resolution of your display for design and layout, the developers of alpha ask that you design postcard-sized artwork in a postcard-sized area of your screen. The issue is compounded by the app’s lack of a zoom tool—you cannot zoom in to see more detail, and if you bump up the canvas to a printable resolution, you cannot zoom out to see the entire composition. The underlying rationale for this approach is to reduce the workload and improve the performance of your system, but it's far too restrictive. It's also poorly conveyed within the app (you'll need to read the manual), and thus can be confusing to designers. However, alpha ultimately does allow you to export artwork at any dimension and resolution you choose, and in a variety of formats (JPG, PNG, PSD). cf/x alpha 1.2.5 is certainly a capable collage editor, helping you put together many different types of photo collages with a high degree of customizability. The app’s shortcomings don’t exactly sink the ship, but you may find its methodology somewhat cumbersome and counterintuitive.